We already told you that in mid July and now some photos leaked from a new source confirm that Apple is bringing FaceTime, iPhone 4’s video chatting feature via a front facing camera, to the next iPod Touch. MacRumors is the blog that released the photos yesterday saying they were sent to them by Apple parts supplier iPhonerevivers. 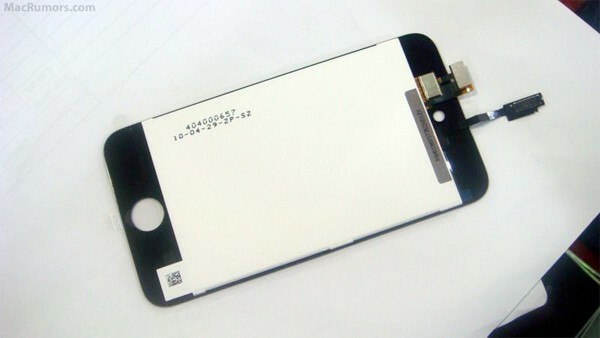 Photos show a new iPod touch LCD screen and in place of an earpiece is a slot perfectly suited for the front-facing camera. Apple usually launches the new iPods in September and with its next press event just weeks away, speculations and rumours have started flying around but these photos prove that there’s some truth to the ones about overhauling the iPod Touch. iPhone 4’s video calling feature has been a huge hit and Steve Jobs has said on record at the WWDC earlier this year that “Apple will ship tens of millions of FaceTime devices this year.” He didn’t say iPhones, so it would make sense that Apple is planning to put FaceTime in other devices. The iPod nano already has a camera and putting one in the Touch version is now a must. Just to refresh your memory, we reported that it was Rob Hennessey, an Apple retailer from UK who revealed in July this year that Apple is set to market the new iPod Touch as a multi media device aimed at the youth and will carry several features of the iPhone 4.